The Westville Conservancy has a monthly watch on invasive plants and in the month of March, the conservancy is focusing on is Canna Indica, also known as the India or Udumbedumbe in IsiZulu. According to the conservancy, the Indica is classified under Nemba 1b and must be removed and destroyed from your property. It is native to tropical areas of South and Central America, the West Indies and Caribbean and has naturalised in many countries including Australia, New Zealand, Kenya, Uganda and Tanzania. Canna indica is a perennial herb with rhizomatous roots and upright stems which grow 90cm to two metres tall. 30 cm wide, elongated or elliptical ending in a point. The flowers can be red or orange. The seeds are held in green spiny capsules which dry and release perfectly round seeds which are black. Canna indica can form dense clumps in damp areas including stream banks. One little known fact is that the rhizomes are edible and have been cultivated by indigenous people of the Americas for thousands of years. The seeds are often used as beads and in rattles. The Westville Conservancy said that rhizomes can be destroyed by placing them in a black plastic bag, and leave in a sunny place to rot, after which they can be added to your compost heap. Don’t forget to remove any seed heads and put them in your general rubbish for removal by waste services. Apart from the conservancy’s daily operations, the conservancy is involved in the M13 Roadway IAP clearing and replanting with indigenous plants, revitalising Westville by reclaiming neglected public spaces for indigenous planting, monitoring environmental issues in Westville, building up plant stock and growing rarer locally indigenous plants and assisting the community with gardening solutions. 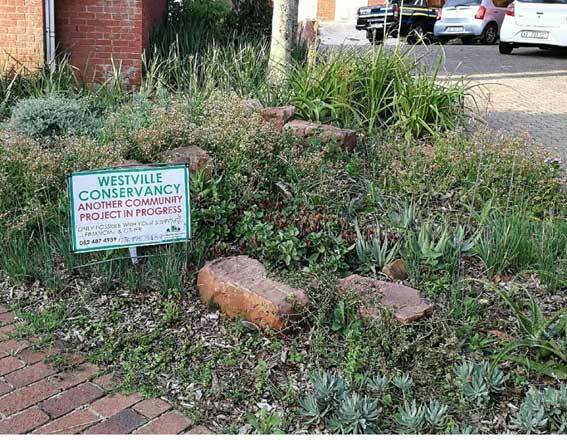 Recently, the Westville Conservancy beautified the Westville SAPS front garden as part of its community projects. To have invasive plants removed from your property, contact Clive on 072 838 5834 or Rob on 083 777 0872.